Kansas City, Missouri - The Allen Americans, ECHL affiliate of the Minnesota Wild, dropped a second straight in Kansas City as the Mavericks beat the Americans 4-3 on Saturday night. Kansas City jumped out to a 1-0 lead with a goal at the 7:42 mark of the first. Willie Raskob fired one from the right side of the ice that snuck past Kyle Hayton to give the Mavericks the early edge. Kansas City would cash in on the power play, as Greg Betztold fired a blast from the slot that found the back of the net to put Kansas City up 2-0 after the opening frame. Neither team scored in the second frame. The Americans played the first half of the third period without all-star defenseman David Makowski, who was given a ten-minute unsportsmanlike misconduct. The Americans battled back in the third with three straight goals to grab a 3-2 lead. Adam Miller on the power play at 6:38, then Dante Salituro at 7:19, followed by Joel Chouinard at 8:49. Unfortunately Kansas City wasn't done either. Rocco Carzon scored at 13:35 to put Kansas City even at three. Then Cliff Watson less than a minute later to put the Mavericks up 4-3. 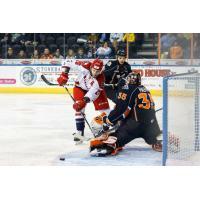 Kansas City would hold on to win and extend the Americans losing streak to three games. The Americans continue the 6-game road trip next Wednesday night in Wheeling against the Nailers. The first meeting since the 2016 Kelly Cup Finals.